Is your smile affected by teeth that are decayed, chipped, cracked, or in some other way structurally damaged? If so, dental bridges or dental crowns may be an ideal solution for you. Our Manhattan, New York cosmetic and restorative dentistry practice has the tools you need to restore health and function to your teeth and gums. Dental crowns, colloquially known as “caps,” engulf the entire surface area of a tooth that has been structurally compromised. 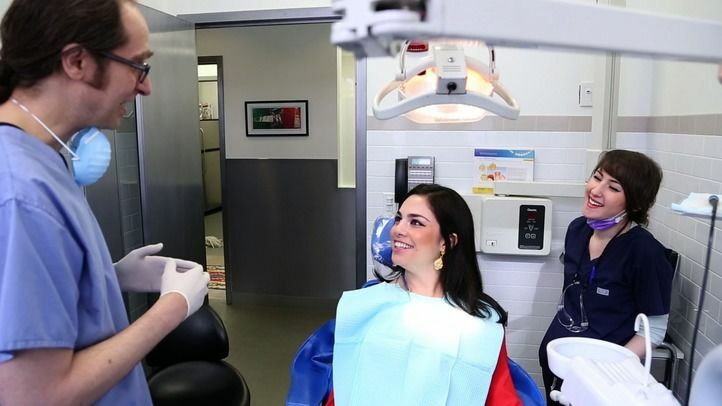 Whether a tooth is cracked, chipped, broken, or decayed, a dental crown can improve the function of the mouth and enhance the appearance of the smile. Designing and installing dental prosthetics such as dental crowns and bridges involves a lot of preparation and technical skill. Before a crown can be placed, the tooth must be prepared through the removal of damaged material. Next, a mold is taken of the tooth. This step is critical to the design of the crown because it is from the impression that the prosthetic is crafted. While your dental prosthetic is being created in our in-house state-of-the-art lab, our team will provide you with a temporary crown. Our dentists suggest that patients who wish to undergo teeth whitening do so prior to having a dental crown installed. Although porcelain is not affected by whitening treatments, we can customize your crown to match your newly whitened teeth. Once your dental crown or bridge is milled, our Manhattan, New York team will ensure that it fits properly and functions flawlessly. After making any necessary adjustments, Dr. Fine or Dr. Salehezadeh will bond the porcelain prosthetic to your tooth. Dental crowns may also be attached to dental implants to replace missing teeth. Improvement in the appearance of your smile - Your restoration will match seamlessly with your surrounding natural teeth, restoring harmony and symmetry to your smile. Improved function - Patients who have a dental crown or bridge installed will be able to see and feel a noticeable difference in their smiles. Dental crowns and bridges will allow you to eat, speak, laugh, drink, and smile much easier and without feeling self-conscious. Improved support - Having a smile that is complete will ultimately protect your healthy, existing teeth from being damaged. Our dental professionals utilize only metal-free restorations crafted in our in-house lab to minimize the cost of creating the prosthetics and reduce the amount of time it takes to design and install your dental crown or bridge. To learn more about dental crowns and bridges, contact Fine Dental today. Our office is conveniently located in Midtown Manhattan, New York, near all major transportation outlets.